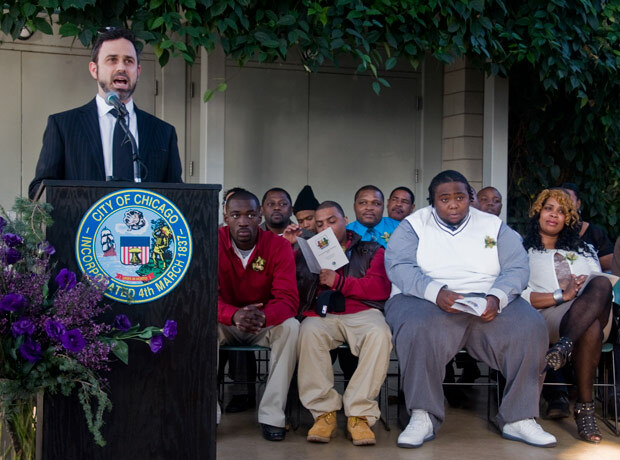 Department of Transportation Commissioner Gabe Klein congratulates the 2012 class of Greencorps — a green jobs training program run by the city. 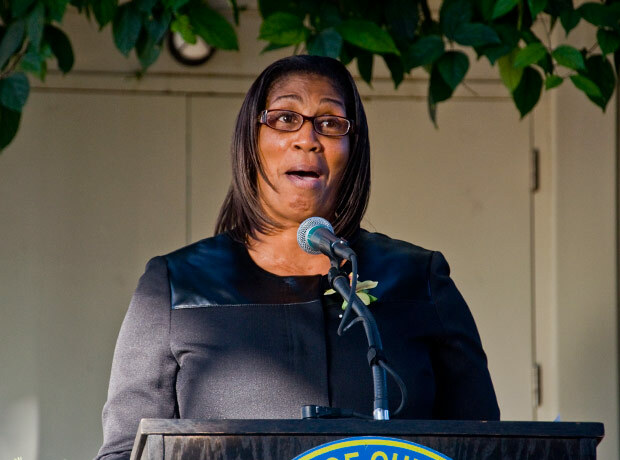 Treasa Wilson, a 55-year-old custodian from the city's West Side, was the 2012 class speaker. Another 22 Chicagoans graduated Friday from the city’s green job training program, Greencorps Chicago, earning qualifications in a slew of industry skills and hopefully a leg-up in a job market that previously deemed them hard-to-employ. This was a transition year for the 19-year-old program, as the city’s Department of Environment continued its merger with the Department of Transportation. The 2012 program was scaled back from previous years, notably phasing out its direct support for community gardens. In addition to their Greencorps diplomas, each graduate collected a binder of certificates earned throughout the course of the program, from hazardous materials training and CPR to brownfield clean-up. Solebo spent years looking for work after her release from prison in 1993. Greencorps and other job training programs helped her land a job with Christy Webber Landscapes, where she has worked for 13 years. Greencorps has graduated 415 Chicagoans since 1994. The work — planting trees, landscaping and helping manage Chicagoland’s natural areas — pays minimum wage and emphasizes hands-on learning. Wilson grew up in East Garfield Park and now lives in Austin. Once terrified of worms, Wilson now wants to work in a plant nursery. Her transformation began three years ago, when she started keeping plants to cope with the loss of her grandson, Johnathan. She started caring for them like family members. Greencorps was a more formal introduction to botany and landscaping. Wilson learned to identify plant species in the wild, cut back invasive buckthorn and manage landscapes through controlled burning. She is studying for her GED. “You’re just trying to make this a better place to live, and make this a cleaner and greener city,” she said. “But it’s going to take more than just me and Greencorps."